Judges;-Mr Robert McTurk, Glenhowl, Kendoon, Dalry, Castle Douglas and Mr Thomas Carruthers, Peela Hill, Bewcastle, Carlisle. A packed ringside saw Society Vice President Mr Graham Noble, West Acres, Kirklinton, Carlisle lift the champion female trophy and the top price of the day for the second year running. This year, it was the 24 month old stylish heifer West Acres Fern, by AI sire Adam of Lochurr and out of Barlaes Nancy which Graham kept after his dispersal sale and sadly lost last year. Fern was sold for 2800gns to senior judge Mr Robert McTurk and will join his herd at Barlaes, Dalry. The male champion was from Andrew Brown, Drumhumphry, Corsock, Castle Douglas, Drumhumphry Wrangler is by the senior herd sire, Jake of Nether Rusko and out of Drumhumphry Lady Heather. 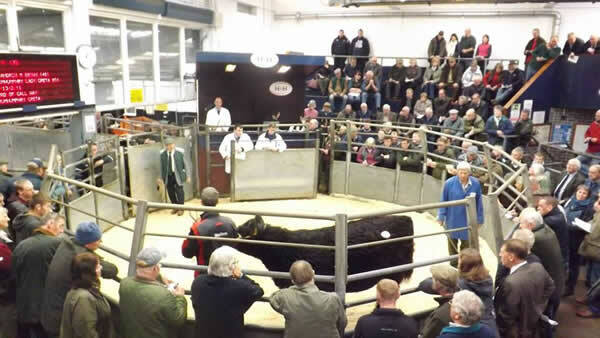 This December 2012 is off home with Messrs G & C Neve & Son, Haining House Farm, Lambley, Brampton, Cumbria for 1500gns. 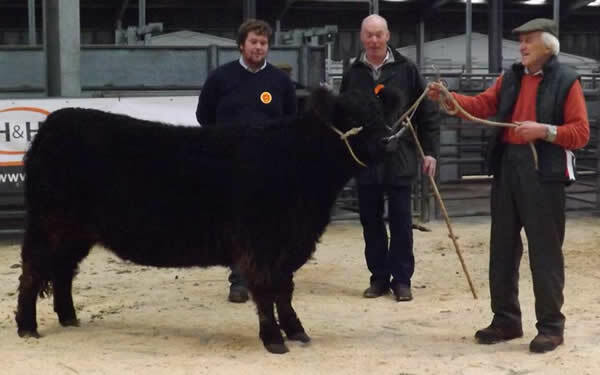 Top Price Male was from father and son team, John and Andrew Tullie, Bowanhill, Teviothead, Hawick, their senior stock bull, Ben Lomond Rolex sold for 1800gns to Mr M Hodgson, Wasdale Head Hall Farm, Wasdale, Seascale . This April 2009 born bull was being sold as he was coming on to his own daughters. The other bull sold on the day was from Mr Keith Laurie, Snowden Close, Gilsland, Provost of Snowden Close is a June 2012 born Barfil Barnstormer son and out of Marina 6th of Snowden Close . This bull sold for 900gs and he and 22 other females went home with new member Messrs Stables and Son, Greaves Farm, Field Broughton, Grange –over- Sands who is establishing a new herd. The next top price in the females was 2400gns which was achieved twice, this first one was for an in calf heifer from Andrew Brown, Drumhumphry Lady Greta 904, this October 2012 born Lord of Gall-way daughter is off home with Mr N Ireland, New House Farm, Drgg, Holmrook, Cumbria, who is continuing to increase his herd and is now up to over 40 head. The second at that money was from Mr Walter Henderson, Whitehill, Lockerbie, Dumfriesshire, Myrtle 556 of Whitehill, this senior bulling heifer who is a Neilman of Whitehill daughter and out of Myrtle 234 of Whitehill was purchased by Messrs Wallace, Farney Sheilds, Ninebanks, Hexham. Once again the Waugh Family Kilnstown, Bewcastle, Carlisle had a great run of 5 junior bulling heifers, the top price was 1900gns for Marina 82nd of Kilnstown, this June 2013 born heifer is by Orinocho of Over Barskeoch and out of Marina 65th of Kilntown she was purchased by Mr R Maxwell, Howside, Ennerdale, Cleator, Cumbria, Mr Maxwell also paid 1800ngs for another Orinocho daughter, Bridget 29th of Kilnstown. Another Orinocho daughter made 1850gns, Bridget 27th of Kilsntown, to Messrs B Dickinson & Co, Brock Stones, Kentmere, Kendal. The five heifers averaged £1638.